Sir William Wallace (c. 1270 – 23 August 1305) was the Guardian of Scotland and resistance leader during the Wars of Scottish Independence. 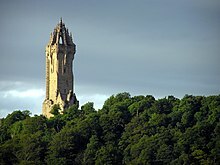 This page is for actual quotations of or about Wallace; for quotations from the 1995 film based upon his life and legends, see Braveheart. 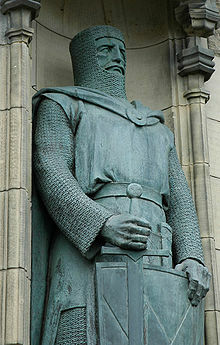 For other uses, see William Wallace (disambiguation). "For Freedom", or "For Liberty" are translations of the Latin motto of Clan Wallace. Variants: I hae brocht ye to the ring, now see gif ye can dance. I have brought you to the ring, now see if you can dance. I have brought you to the ring. Dance if ye can. I have brought you to the Revel, Now dance if you can. Variant: I could not be a traitor to Edward, for I was never his subject. My Son, Freedom is best, I tell thee true, of all things to be won. Then never live within the Bond of Slavery. Scotland thrice he shall bring to peace. So good of hand again shall ne'er be kenned. Shall many thousands in the field make end. And Scotland thrice he shall bring to peace. Wallace by Blind Harry (c. 1460) as translated by William of Gilbertfield The Life and Heroic Actions of the Renoun'd Sir William Wallace, General and Governor of Scotland (1722). 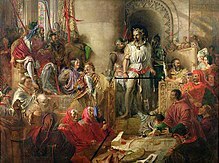 The whole followers of the nobility had attached themselves to him; and that although the persons of their lords were with the King of England, their heart was with Wallace, who found his army reinforced by so immense a multitude of the Scots, that the community of the land obeyed him as their leader and their prince. Henry Knighton as quoted in History of Scotland (1841) by Patrick Fraser Tytler, p. 117. Promotional phrase for the movie Braveheart, written by poet William Ross Wallace (1819-1891). Shall so many nobles will cheer for his death and partake in wine and alcohol. And Scotland he will not ever bring to peace nor free Scotland from the English chain. So he will not encourage others for he is truly dead. Torquil Fingall as quoted in the History of Folk Songs.